Amino acid analysis (AAA) chemistry is considered to be a fundamental analytical tool in peptide, protein and metabolite research. The knowledge of the amino acid composition of a protein or peptide hydrolysate, of free amino acids in physiological fluids, and a myriad of other biological samples containing compounds with amino groups provides basic information crucial to further biochemical studies. Key criteria for analytical methods are accurate and precise identification and quantification of the numerous amino acid species with high sensitivity detection and low sample consumption. Furthermore, amino acid analysis chemistry can be used to accurately identify and quantify amino acids, primary and secondary amines present in biological fluids, food stuff, beverages, feed and biotherapeutic products, to name a few. Amino acid analysis services from Bio-Synthesis are conducted under strict standard operation procedures. Our Total Quality Management (TQM) platform ensures that each analysis is triple checked. If you have any questions or for additional information, please contact us. A pure peptide or protein has a defined chemical formula. The determination of the amino acid composition of the two molecules allows for the estimation of the purity of a peptide or protein, as well as to define their chemical composition. Amino acid analysis is a method which breaks down proteins and peptides into their components. The analysis of the released free amino acids allows determining the identities and relative quantities of those amino acids. This method allows determination of the absolute quantities of amino acids derived from peptides, proteins, or other samples. Here, the use of a Waters Breeze™ 2 HPLC System with software, a Waters 1525 Binary HPLC pump, a Waters 2475 Multi λ Fluorescence detector and a Waters 717 plus Autosampler injector, is described. This system uses reversed-phase chromatography with pre-column derivatization of the amino groups with the AccQ●Tag chemistry in aqueous conditions and fluorescence detection of the derivatized compounds. 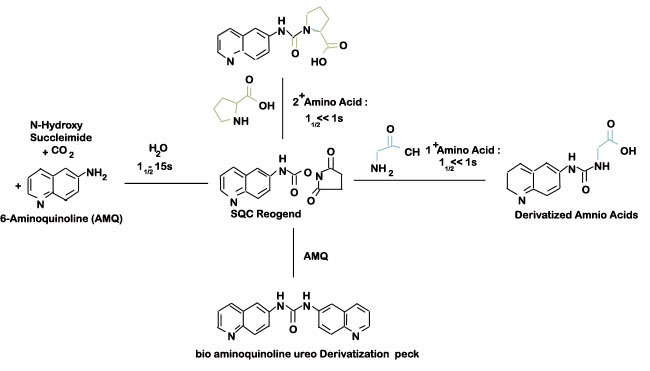 Prior to their analysis, amino acids are tagged with 6-aminoquinolyl-N-hydroxysuccinimidyl carbamate (AQC). Next, following the pre-column derivatization of the analytes, separation and detection are achieved with a reversed-phase column and a multi wavelength fluorescence detector. The analysis is complete within approximately 45 to 60 minutes, depending on the separation protocol used, and allows for the identification and quantification up to 42 amino acids and related compounds. Samples are automatically analyzed with assured performance methods and reports are generated using pre-defined software templates. Figures 1, 2 and 3 describe the chemistry of the derivatization reaction as well as the resulting reaction products. 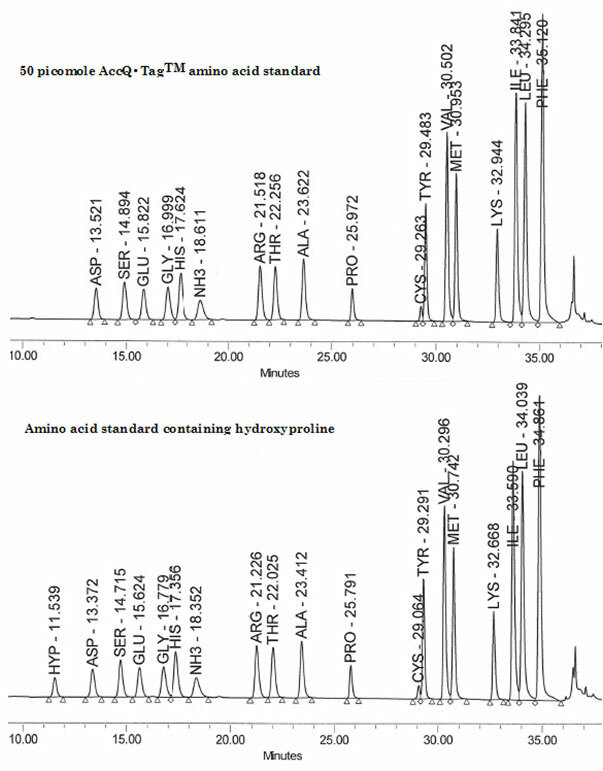 Figure 4 shows the chromatographic traces of two amino acid standards; one without and one with hydroxyproline. Figure 1: AQC (6-aminoquinolyl-N-hydroxy-succinimidyl carbamate. Chemical structure (left) and energy minimized molecular model (right). Calculations were done using the MNDO module from CACHE Scientific. Figure 2: Amino Acid Derivatization Chemistry. Both 1º and 2° amino acids and amines react rapidly with AQC to produce highly stable, fluorescent derivatives. The excess reagent reacts with water to form a free amine having significantly different fluorescence spectral properties.